“Think On” Memorial Scholarship | Think On! 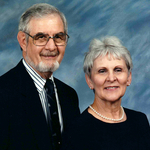 Billy McClellan and Joy Goodman grew up in Central Texas around Coleman, Santa Anna, and surrounding towns. They graduated from Howard Payne College and were married for over 62 years until Joy’s passing in May of 2017. As inheritors of Clan MacLellan traditions, Billy and Joy taught their sons Russell and Stan to respect authority, to promote goodwill, to pursue truth, and to honor God in all things. The scholarship honors the memory of McClellan family members who contributed to the development of Coleman County. It also provides a bridge of assistance for Coleman County youth who challenge themselves to “Think On” by pursuing academic or vocational education. The McClellan “Think On” Memorial Scholarship is managed by the Coleman County Foundation via the Community Foundation of Abilene.